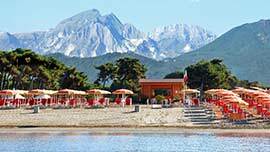 Characterized by the unique Apuan Alps that protect the town from the cold north winds, Marina di Carrara is a modern seaside resort with many facilities and a fine, large, soft sandy beach stretching between the blue on one side and green pine-woods on the other one. 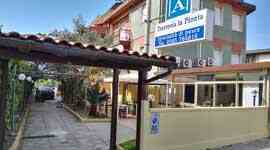 Marina di Carrara is in a geographically favourable position on the Tyrrenian coast. 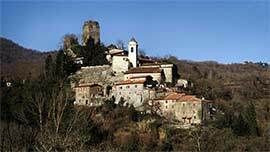 An excellent network of roads and railways make it the most reachable for Piedmont, Lombardy and Emilia. 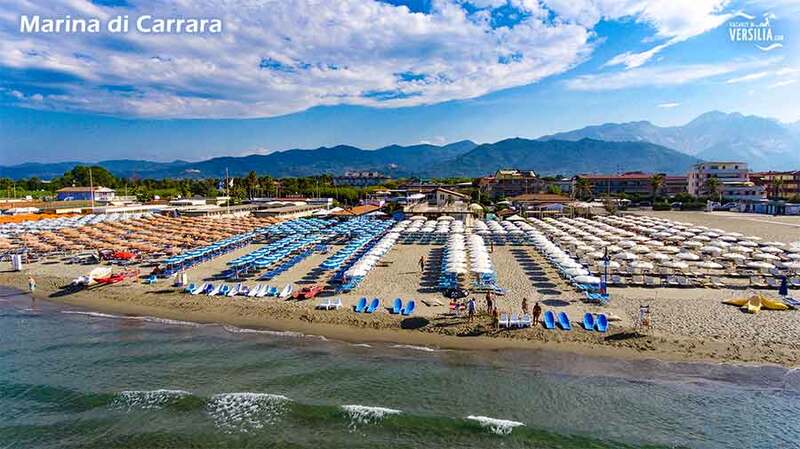 Thanks to the same efficient network you can reach all the main monumental and artistic attractions in Tuscany from Marina di Carrara in a short time. Touristic catering is top-rate and comfortable (with hotels, camping sites and private flats) and for number and service it is organised in order to satisfy the most various requirements. Besides a mild climate all year round, sunshine, sand and cool breezes that mitigate the hot summer, you also have the privilege of bathing in the sea and then go sun-bathing in the mountains only a few kilometres away at more than 1000 m above sea level.That is without mentioning the various excursions you can take inland to see places rich in art and history while enjoing incredibly beautiful views on the way. Besides a mild climate all year round, sunshine, sand and cool breezes that mitigate the hot summer, you also have the privilege of bathing in the sea and then go sun-bathing in the mountains only a few kilometres away at more than 1000 m above sea level.That is without mentioning the various excursions you can take inland to see places rich in art and history while enjoing incredibly beautiful views on the way. Campocecina 1350 m above sea level is just over half an hour's drive away from Marina di Carrara and theres a standpoint from which you get an amazing view of nature's spectacular gifts. You get a sweeping look of the islands of the Tuscan Archipelago, Corsica, the Maritime and the Graian Alps, and then down to the heaps of marble debris below, criss-crossed with steep winding tracks. For the entertainment of her guests. Marina is equipped with every modern facility for practising any sport. There is also an efficient Club Nautico (Sailing Club) that takes a very active part in national and international events. It also has a functional tourist port. The International Marble and Machines Fair with its spacious and well organized exhibition area adds even more importance to Marina di Carrara. In the summer, the greatest attractions and the more amusing games wait for you every day at the luna park of Marina di Carrara. You will enjoy yourself with tens of spectacular attractions.